(Dyess AFB, Texas, April 17, 2010) -- The Air Force's top military leader flew and delivered a new C-130J Super Hercules here April 16 from Little Rock Air Force Base, Ark. Opening a new era in tactical airlift for Dyess AFB, Air Force Chief of Staff Gen. Norton Schwartz spoke to a crowded hangar of distinguished visitors and service members about the airlifter and the Airmen who will operate it. "We must bring the best that we possibly can to the joint fight; we are doing this by modernizing our inventories," General Schwartz said. "The delivery of this C-130J is a step toward modernizing our airlift inventories and we will continue to make progress. But that alone will not guarantee success; our people who permit us to use these machines to best effect are our number one asset." He presented a ceremonial key to the aircraft's crew chief, Staff Sgt. Ryan Flores, who was Air Mobility Command's crew chief of the year. "The aircrews from the 317th Airlift Group are deployed in support of ongoing operations around the world, and are serving as reliable and trusted teammates to our joint and coalition partners," the general said. The general said that the men and women of the 317th have been deployed more than 2,200 continuous days, with missions in Haiti, Iraq, Afghanistan and the United States. Dyess aircrews also accumulated more than 17,000 flying hours last year, an amazing accomplishment. The group commander responsible for executing that demanding schedule said the delivery of the C-130J is the beginning of a new capability for the group and the continuation of a long history of Abilene airlift. C-130s have been flying here since 1961. 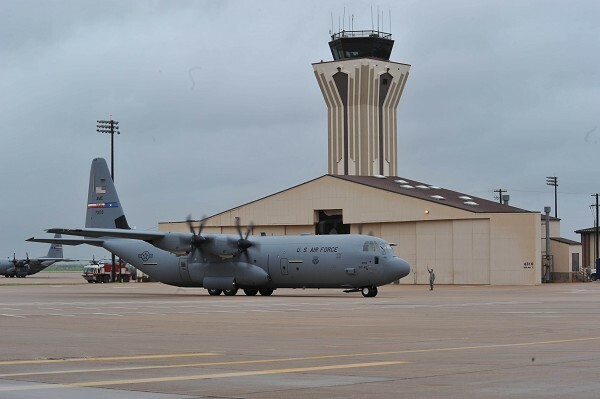 "Today marks the day where the capability of the 317th Airlift Group, Air Mobility Command and the U.S. Air Force has significantly increased," said Col. Dan Dagher, commander of the 317th AG, "and starts another 49 years of C-130 presence in Abilene." Colonel Dagher said the base would receive 27 more aircraft and, by 2013, ultimately becoming the largest C-130J base in the world. Currently, a unit in England has 24 C-130Js. The chairman of the Abilene Military Affairs Committee, Dr. Jim Webster, said the delivery of the new airlifter was a welcome upgrade, noting that the busiest C-130 unit in the Air Force had the oldest model. Named the "Pride of Abilene," the first new Dyess airlifter reflects the unique relationship between the base and the community around it. Texas Congressman Randy Neugebauer, who participated in the delivery of the aircraft from Little Rock, also spoke at the arrival ceremony and highlighted the exemplary relationship the community has with the base. He noted that the AMC award that honors community support was renamed the "Abilene Trophy" after the city won it so many times. The new Dyess C-130J rolled off the production line only two months ago at the Lockheed Martin plant in Marietta, Ga. C-130Js entered the Air Force in 1999 and incorporate state-of-the-art technology to reduce manpower requirements, lower operating and support costs and provide life-cycle cost savings over earlier C-130 models. Compared to older C-130s, the J model climbs faster and higher, flies farther at a higher cruise speed and takes off and lands in a shorter distance. The C-130J also offers a longer version with more carrying space.